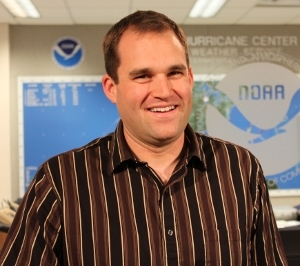 Q & A for NHC - Michael Brennan, Ph.D.
What does being a senior hurricane specialist mean? It means you're in charge of the shift and all of the products that go out, making sure that everything make it out on time, and that watches, warnings, and impacts are coordinated within the NWS and with other countries. There's a lot more to the job than just making the forecast. That's the job description. What does it mean personally? It's a really unique job, one that's focused on high-impact high-visibility weather. We are not just engaged in the forecasting part of the job, but also in research, outreach, and training. We.re really connected to whole hurricane program, not just in the Weather Service but the entire tropical cyclone research community. That really appeals to me because I enjoy teaching, training, and research in addition to the forecasting part of the job. You mention the word "community". The Hurricane Specialist Unit strikes me as a tight community. We all bring different areas of expertise to the table within the unit and we all have a lot of respect for each other and the work that we do. Everyone sort of has their own niche and things they like to focus on and our wide variety of backgrounds and experiences is a real benefit to the unit. Did you interest in hurricane start early? I think most people who are meteorologists all had some kind of an experience as a child that led to a fascination with weather. I grew up in Roanoke, Virginia, and there was a catastrophic flood there in November of 1985 when I was eight years old. The flood was partially caused by the remnants of Hurricane Juan, which made landfall along the Gulf coast and got caught up in a frontal boundary. There were several days of rain and over 6 inches of rain on the final day which led to the flooding. My Grandmother lost her home in that event, and that made a big impression on me. I also vividly remember Hurricane Hugo in 1989, which hit Charleston, South Carolina, and was forecast to come very close to western Virginia. Hugo ended up moving farther west, but we still got out of school for the day and it was an exciting event to witness as a kid. I kind of tested the waters out with a couple of intern programs that I did while in high school. I got to see the broadcast side of meteorology at WDBJ-TV in Roanoke where I spent time during my junior year as part of a mentoring program through the school system. I also did some volunteer work at the NWS Office in Blacksburg, Virginia and got to see how a local NWS office worked right after the big modernization of the NWS in the early to mid-1990s that brought in Doppler radar and a lot of other advances.. After deciding that meteorology was the field for me, I went to a local community college and then transferred to North Carolina State University in Raleigh, NC, and got my undergraduate degree in meteorology there. Did you go right into the working world? I began thinking about graduate school and discussed my options with some of the faculty at NC State. The university already had established a strong collaborative research program with the Raleigh NWS office, and that was the type of research I was interested in, so I decided to stay on at NCSU for graduate school. NC State had just been awarded a Collaborative Science, Technology, and Applied Research (CSTAR) Program grant, and these grants were aimed at addressing regional forecast issues at various NWS offices. This first project grant focused on cold-air damming and coastal fronts, and my Master.s thesis cold-air damming erosion came out of that project. I found that I really enjoyed research and the group I was working in at NCSU with my advisor, Prof. Gary Lackmann, so I decided to stay on for my Ph.D. My Ph.D. research focused on the January 2000 East Coast snowstorm, which was one of the highest-profile forecast failures in recent memory in the eastern U.S. The event was poorly forecast even up to the day it began, and Raleigh received a crippling snowfall of more than 20 inches. It was pretty exciting to get to experience the storm first hand and later delve into it from a research perspective. My Ph.D. work looked at why the operational model forecasts were so poor, which involved a lot of observational analysis and modeling work. So now what do you do with the Ph.D.? I wanted to stay involved with operationally-related research, but it was largely a matter of luck and timing that when I finished grad school in 2005 that there was a post-doctoral position open here at NHC. The job focused on satellite ocean-vector winds, mainly from the QuikSCAT satellite at the time, and working on improving the use of those winds in operations here at NHC. It sounded like a good fit for my interests and experiences, so I applied and was lucky enough to get the job. I didn't have a lot of background in satellite remote-sensing at the time, but I had the research to operations experience from my graduate work along with a familiarity with the NWS, and that helped me transition into the job. I was able to learn a lot about operational marine forecasting through NHC's marine program as well as the tropical cyclone side of NHC during the 2006 hurricane season. I also had the opportunity to get involved with higher-level policy work within NWS and NOAA to plan for and learn how to best utilize future sources of satellite wind data. But you could not stay? A post-doc position is designed to be temporary and hopefully serve as a stepping stone to something else. I'd been here just over a year when the science and operations officer (SOO) position at the Hydrometeorological Predication Center came open. It fit my interests well because the SOO is involved in applied research, forecaster training, and science infusion into the forecast process and I was lucky enough to be selected. HPC has a really wide mission, and mainly provides guidance to the local NWS offices around the country for everything from precipitation (QPF) and winter weather (snow and ice), medium range forecasting, and also serves as one of the backups for the hurricane program at NHC. While I was only there from early 2007 to late 2008 I really enjoyed my time there and learned a tremendous amount and got to work with a lot of great people. Were you looking to leave? Not really, but Rick Knabb left NHC and his senior hurricane specialist position became vacant. That was a job I was certainly interested in, and I knew they didn't open up very frequently, so I took it the opportunity to bid on the job and was selected, and came back to NHC in late 2008. What was the greatest challenge coming back? My background is more in synoptic/dynamic meteorology and mid-latitude weather, not tropical meteorology. And while the mid-latitudes certainly play a role in tropical cyclone forecasting, there was a bit of a learning curve as I began working in the job. However, I like looking at tropical cyclone forecasting from a little different perspective. But overall the biggest challenge remains intensity forecasting, particularly forecasting rapid changes in intensity. The operational time crunch is always a challenge, particularly coordinating watches and warnings, especially when dealing with multiple countries, such as when a storm is impacting the Caribbean Islands. In some ways, coordinating watches and warnings for the United States is easier because it's a more refined process and is self-contained in our own organization. It takes a while to develop confidence and trust your instincts in difficult forecast and watch/warning situations. Just about every shift I worked I would come away thinking "Wow, you really don't want to do that again," or "You really want to think about doing this a different way next time". Every day is a learning experience and it can be very humbling. What about during a big storm? Trying to step away from a big storm, even when you go home, is very challenging. Sometimes after working a midnight shift its hard to sleep during the day. But if there is a big storm, or if the forecast from the night before was very challenging, the second you wake up, your brain starts to turn; did this decision I made earlier turn out to be the right one? Then you reach for the laptop, and before you know it you're working 24/7 even when you aren't "working". In the long term, I'm sure there will be opportunities to advance my career, perhaps into management here or elsewhere within the NWS. But I'm very happy in the position I have now, and I.m pretty sure that whatever job I have next is not going to be as fun as this one is, especially with the day-to-day forecasting and operations. When you move on to management, you give up a little bit of that. How do you let it all go when you walk out of here? I try to keep busy at home. I like to work out, and going to the gym or for a nice long run is a great way to unwind and clear the mind. I'm also a big sports and news junkie, so those serve as a good diversion. I also like to travel, and I'm lucky to have family and friends to visit in some great places. During the season, getting out of town for a day or two can be a great way to recharge the batteries.